I Am Setsuna is Square-Enix’s throwback to their 16-bit era JRPGs, bringing back turn based battles, the ATB bar, and a classic world map that makes your character look huge next to scaled down towns. Originally released for the PlayStation 4 in July last year, I Am Setsuna has now made its way to Nintendo’s new console. The Nintendo Switch release also marks the first time that the game has been available on a handheld system outside of Japan. I Am Setsuna’s story revolves around the titular girl, Setsuna, as she goes on a journey across the world in order to reach the Last Lands. Chosen as the latest in a long line of sacrifices to appease the monsters that plague humanity, she intends to fulfil her duty when she gets there, and players find themselves roped into being one of her guardians for the journey. It’s not a pleasant experience for any of them, knowing what must eventually be done, but their resolve is strong. Along the way, they meet a large number of people who want to guard her, each with their own strengths. They join your party, and can fill many different roles during battles. It’s certainly been a while since I did so little grinding for experience in a JRPG, which is actually a little refreshing. Although the battles in I Am Setsuna are turn based, each one tends to be fairly short, with characters’ ATB bars filling quickly, and standard enemies not having particularly high health. What really makes things interesting is the Spritnite system, which gives you a high level of control over which abilities each of your party members have access to. Although not every ability is able to be used by every character, they nonetheless have access to a very large pool of physical attacks, magic, and support abilities. You choose their ability set by equipping multiple Spritnite stones, each of which has a single ability attached to it. Adding to the mix, you can also equip characters with talismans, which grant bonus effects during battle and can affect the way that some abilities work in subtle ways. These two systems combined allow for an impressive amount of freedom for the player, and there’s even combo attacks available if the right abilities are used on sequential turns in battle. It makes for an enjoyable combat experience, but the downside is that the game’s balance just doesn’t feel quite right. With only a minimal amount of training, you’ll start to find battles against regular enemies a little too easy, and there’s only a couple of points in the game where I would say that I was truly challenged. This may have been intentional, as the game does have a strong focus on story, and perhaps the developers just wanted to keep players moving along at a brisk pace. It’s certainly been a while since I did so little grinding for experience in a JRPG, which is actually a little refreshing. Like the vast majority of Switch games, I Am Setsuna can be played in both docked and portable modes. The good news is that the game runs identically in both modes, with no technical issues or lag at all. Like the vast majority of Switch games, I Am Setsuna can be played in both docked and portable modes. The good news is that the game runs identically in both modes, with no technical issues or lag at all. As mentioned earlier, this is the first time that the game has been playable in a handheld form, and the ability to save at any time when on the world map makes I Am Setsuna quite suitable to being a handheld game, and so does the Switch’s low power consuming sleep mode (similar to the PlayStation Vita’s). Although the game does play very smoothly on the Switch, it comes at the cost of a lower frame rate. While the PS4 version runs at 60 FPS, the Switch version runs at 30 FPS. This is where the Switch’s weaker hardware unfortunately shows, although the good news is that it doesn’t affect the gameplay itself in any significant way. Since the game focuses on turn based battles and slow exploration of areas, it’s not as big of an issue as it would be in a fast paced action game or fighter. Graphically, the game doesn’t disappoint. 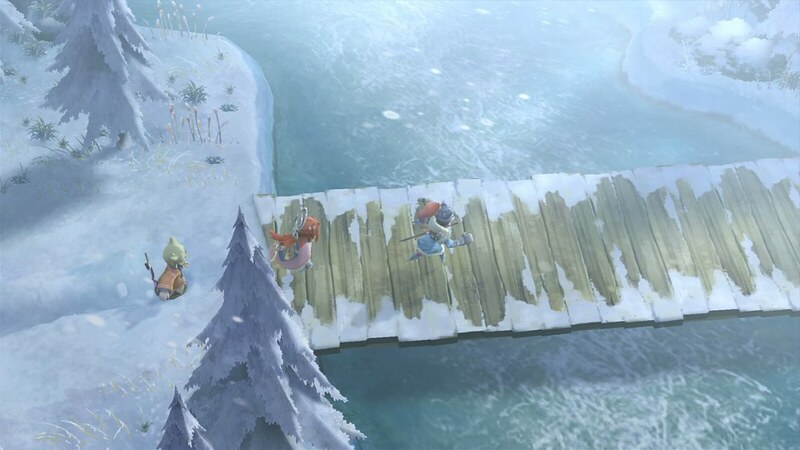 Although the overall presentation of I Am Setsuna is quite minimalistic, it works well here, and we’re treated to detailed environments and character models. Unlike most other JRPGs, there’s no fanfare for levelling up, almost no bright colours, and many environments are simply covered in thick white snow. This is not a cheerful game in any sense, and the visuals reflect this effectively. Speaking of snow, the game features a lot of it, and the developers added some excellent physics to it. Your characters make realistic trails through it as they move around, both in and out of battle, and so do your enemies. It’s a great extra touch. I Am Setsuna’s soundtrack is fairly unique in the sense that it makes use of just one instrument, the piano. Every one of the game’s many tracks is a piano solo, and it certainly works to create a distinctive, somewhat sad atmosphere for the game with many pieces of fairly subdued background music. This fits the game’s tragic themes of sacrifice, loss, and even racism well. However, this also proves to be the soundtrack’s biggest weakness at the same time, since the use of nothing but piano leaves us with a lack of variety. After many hours of playing the game, I found myself wishing to hear even a little bit of a different instrument mixed in. So although there’s some really good individual pieces of music in there, it can all start to blend together and become forgettable. Its retro style gameplay, distinctively melancholy story, and surprisingly deep battle system come together to form a unique experience. Overall, I Am Setsuna is an enjoyable entry into the JRPG genre. Its retro style gameplay, distinctively melancholy story, and surprisingly deep battle system come together to form a unique experience. It also works well as a portable title, which is great for people who aren’t able to sit in front of the TV for hours at a time. While the easy difficulty and overuse of piano do bring the game down a little, it’s the story that will divide people the most. It’s certainly not the typical JRPG fare, which is not a bad thing in itself, but it will turn away many people who like their RPG stories to be a little lighter. Either way, I Am Setsuna remains a solid effort from Square-Enix, and a good launch title for the Nintendo Switch. 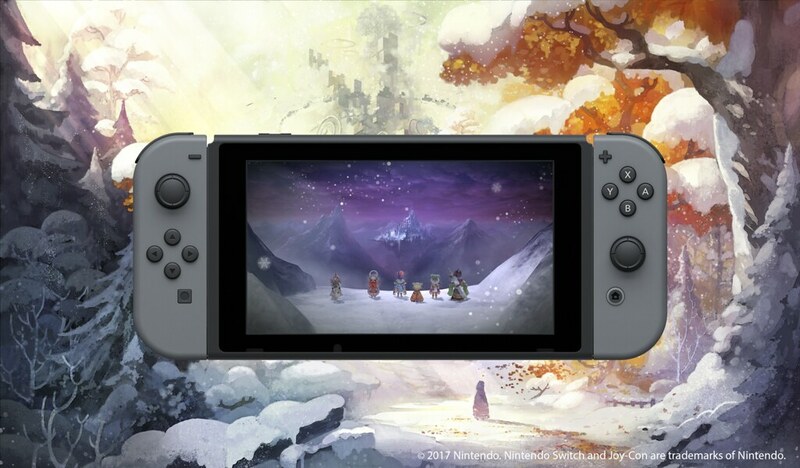 I Am Setsuna is a well made, retro styled JRPG from Square-Enix, and a good launch title for the Nintendo Switch.